Our network attached storage device provides Enterprise-class business continuity without the Enterprise-class price and you have the option to seamlessly store data offsite as well. Network attached storage or NAS fits the needs of mid-sized companies by delivering a price performance combination that superior to either higher availability clustering or the tape solution that are currently used in many business continuity plans. While server clustering is out of reach for most companies. 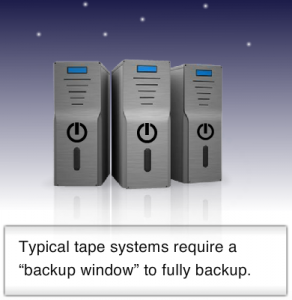 Tape has been widely implemented as a universal backup system for small and mid-sized businesses. 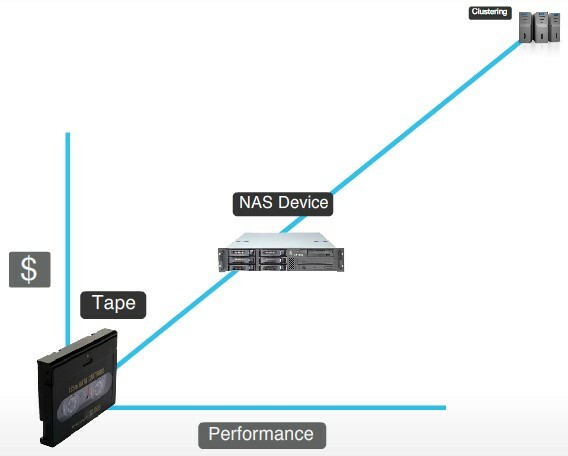 Let’s take a look how tape lacks the recovery speed to minimize downtime. First there is a question of tape’s untested reliability. Analysts have said over the half tape backups failed. 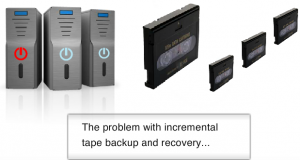 So there is a high probability that if you need to restore from tape, you will be out of luck, second even if the tape does work the numbers are not in your favor for rapid recovery. 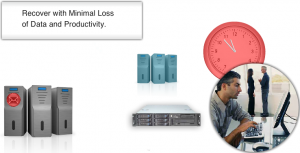 Looking at the RPO (Recovery Point Objective) and RTO (Recovery Time Objective), Tape backups often provides snap shots every 24 hours meaning an entire day’s work could be lost + by the time to restore files or server from tape, your business were likely experienced 24 to 48 hours of lost productivity. 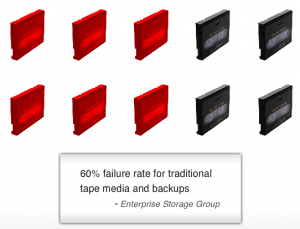 Third tape backups can be very restrictive for infrastructure growth. 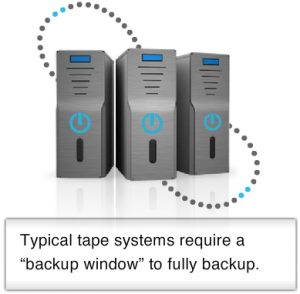 Because of the way typical tape system operates it requires a significant backup window of time to complete full backup but businesses need twenty four seven accesses to valuable systems. Overnight backups are no longer feasible this leads to incremental backups with the only save data which is new or has changed since the last backup. While incremental backup is a great method of shortening backup windows. 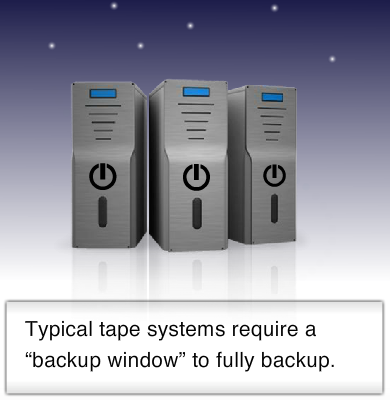 It requires all the tapes made for last full backup to restore system functions that’s why our business continuity appliance comes in. Our NAS device is the perfect complement tool existing tape drive, allowing for a quick disaster recovery process. This device requires no backup windows leaving your critical business up and running. 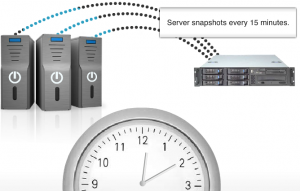 Our NAS appliance can take snapshots of servers every 15 minutes. 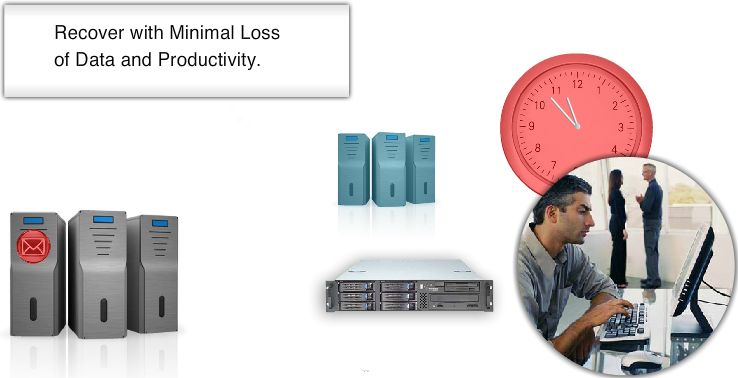 For better recovery point objectives than if the server crashes, our business continuity solution can restore server operations in less than 30 minutes using advance Virtualization tools. 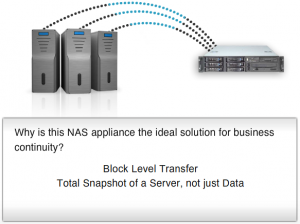 Let’s examine how our NAS device is an ideal business continuity appliance. It all starts with 1’s and 0’s because the device usage reliable and official block level transfer in its snapshots, this allows our solution to take the true and complete snapshots of data, applications and operating system at the most granular level and all the hard drive. Next our NAS appliance produces 15 minutes incremental snapshots that safely reside within the device, ready to be used to restore a file, a file folder, an email or a database all in less than 5 minutes. Now let’s look how our solution keeps your business running. For instance an email server goes down, because the device takes snap shots every 15 minutes, administrator can choose a point in the time shorty before the problem occurred by just the few clicks of the mouse. This appliance allows you to activate as a virtual server to keep business processes up and running while you diagnose the problem and plan course of actions for the down email server in the event of catastrophic failure. Our business continuity solution also includes a boot CD that allows us to perform a bare mental restore on new hardware in a fraction of the time of a typical server rebuild and this NAS device will allow you to eliminate a hardware abstraction layer during the restore process. So that the new drivers can be loaded on the server replacement, no matter which server brand is used? Getting you speedy recovery options in time of crisis. With unique design and programming our NAS drive allows us to have your business operations up and running again in a few simple steps but it only takes one step to protect your IT systems and your valuable data that to call on us to provide you the business continuity assurance.